Then somehow I totally forgot about it once I started trying out lots of recipes for this site. But when I was at the grocery store last weekend trying to figure out what to do for dinner (since my Kroger was totally out of avocados, which I’d kind of needed), I saw these beautiful heirloom tomatoes and this recipe popped into my mind. 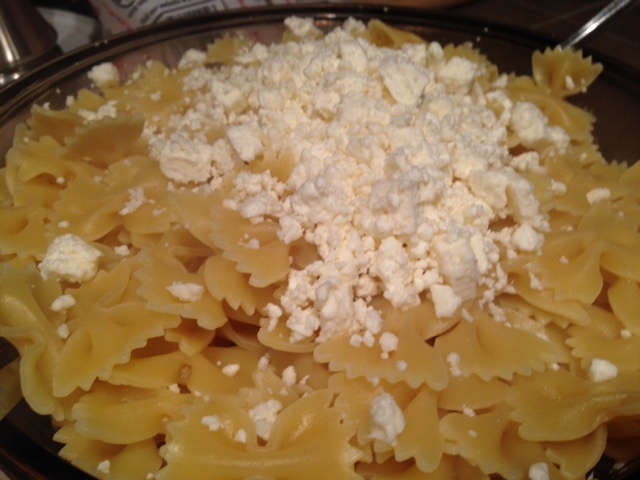 It’s very forgiving, the veggie amounts aren’t super exact and neither is the feta amount. You could substitute kale for spinach, though it definitely would change the texture a little. I recommend this for a night where you just need something on the table fast, and want fresh, healthy ingredients. Set a big pot of water to boil. Once it’s boiling, add a handful of table salt and the pasta, then cook until the pasta is al dente (around 7-8 minutes usually). Hold out about half a cup of pasta water before draining. 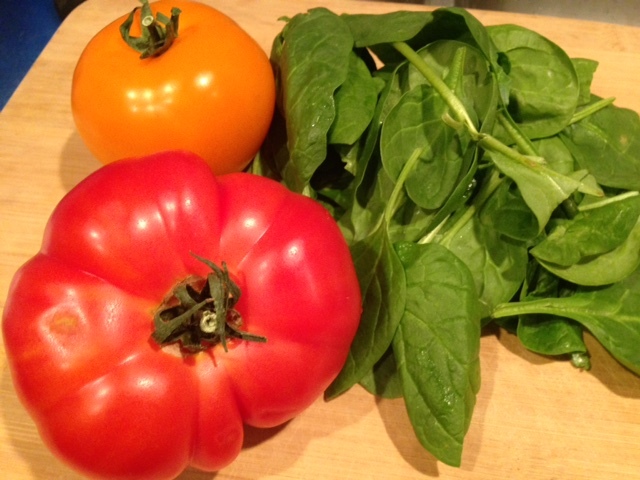 Dice up your tomatoes, removing the core (where the stem is), and give your spinach a rough chop or two to break it up. While the pasta is cooking, heat olive oil in a large skillet on medium or medium-low heat (I use medium-low because my burner is intense). Once it’s getting hot, add the garlic and saute for about 30 seconds (you don’t want it to burn). Immediately add the fresh spinach (see note below for frozen spinach) and chopped tomatoes, and saute for several minutes, stirring occasionally. You may even want to turn the heat down a little, letting it just lightly saute. The tomatoes will release their juices as they cook, turning it into a nice chunky sauce-like concoction. 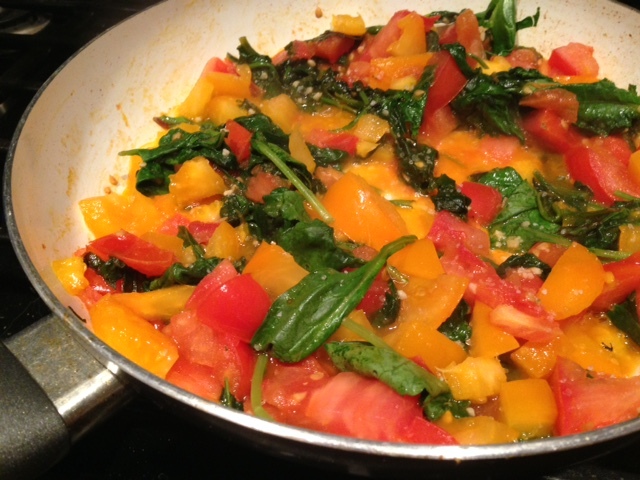 Note, if you’re using frozen spinach, you’ll need to add it to the pan first and cook/thaw it for a few minutes before adding the tomatoes. Season the mixture lightly with sea salt and pepper, but go easy—the feta is pretty salty so you can do the majority of your seasoning when everything is mixed together. 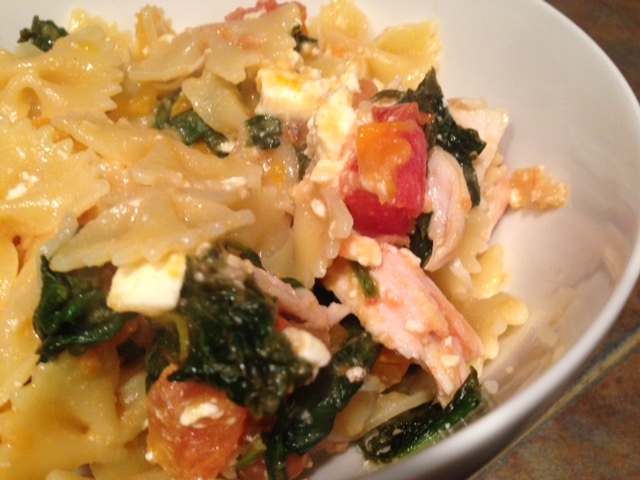 Pour the drained pasta, the tomato and spinach mixture, and all of the feta cheese to a large bowl and toss together. You may need to use a little of the pasta water to thin it out and get everything coated well (the starch in the water helps with this). I threw some chicken in there too, because I was craving protein and I’d just picked up an awesome Sam’s rotisserie chicken. 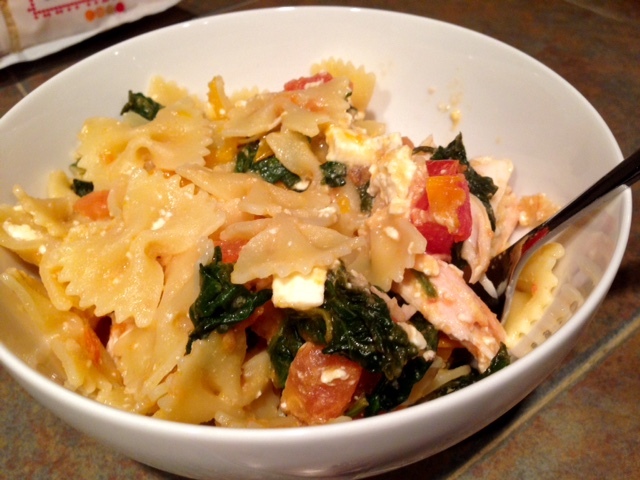 Serve right away, but this does make great leftovers for a few days. You can also throw in some pine nuts or walnuts for some crunch. Set a big pot of water to boil. Once it’s boiling, add a handful of table salt and the pasta, then cook until the pasta is al dente (around 7-8 minutes usually). Reserve about half a cup of pasta water and drain. Dice up your tomatoes, removing the core (where the stem is). 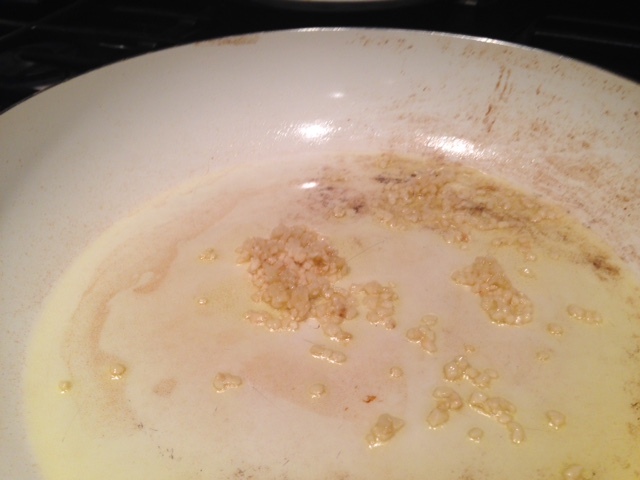 While the pasta is cooking, heat the olive oil in a large skillet on medium or medium-low heat. Once it’s getting hot, add the garlic and saute for about 30 seconds (you don’t want it to burn). 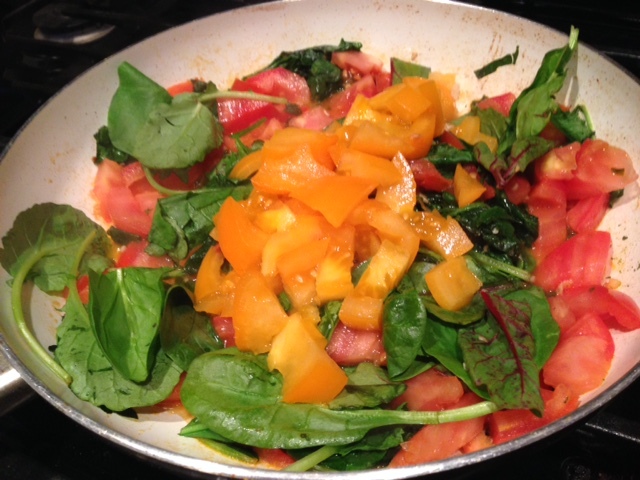 Add the fresh spinach and chopped tomatoes, and saute for several minutes, stirring occasionally. As they cook, the tomatoes will release juice and it will start to turn into a nice chunky sauce-like concoction. 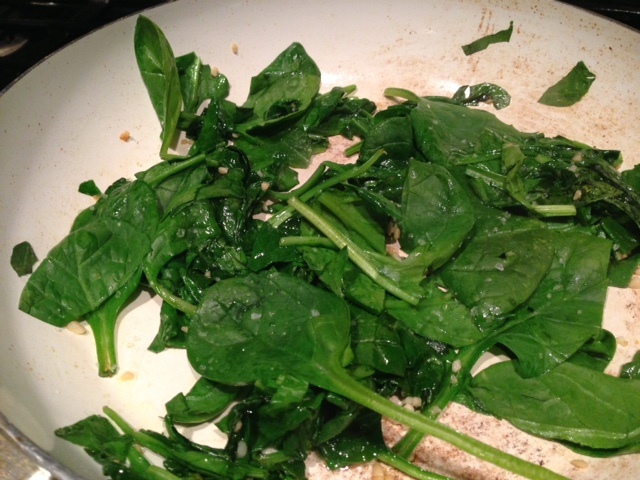 Note, if you’re using frozen spinach, you’ll need to add it to the pan first and cook/thaw it for a few minutes before adding the tomatoes. Season with sea salt and pepper—go light on salt for now, because the feta is pretty salty. 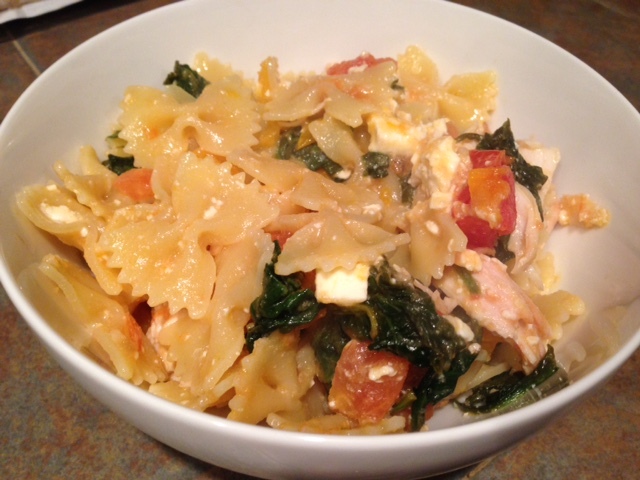 Pour the drained pasta, the tomato and spinach mixture, and all of the feta cheese to a large bowl and toss together. You may need to use a little of the pasta water to thin it out and get everything coated well (the starch in the water helps with this). Serve hot, but makes great leftovers.